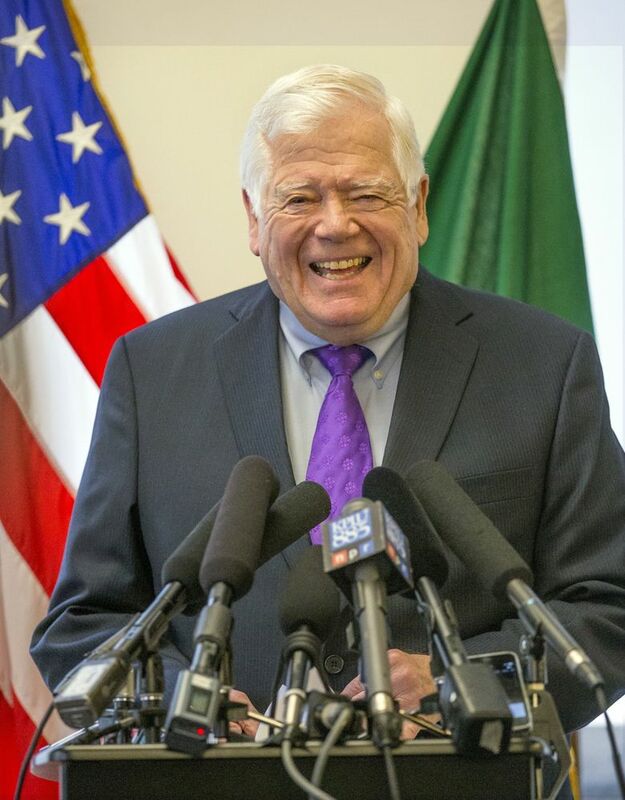 Longtime Democratic Rep. Jim McDermott of Seattle announced his retirement Monday, setting off a scramble among potential successors. Fourteen-term Democratic Congressman Jim McDermott will not seek re-election in 2016, setting off a lively scramble among Democratic contenders for the rare open seat in the liberal 7th Congressional District. McDermott, 79, announced his retirement Monday during a reflective news conference in downtown Seattle, quoting an African proverb and Gandalf the wizard and saying he wants time to pursue interests including painting and sailing. After more than four decades in Washington politics, McDermott said his decision was influenced by events over the past couple of years, including the retirement of longtime congressional colleague George Miller of California, and the death of a friend, Seattle political consultant Blair Butterworth. “I realized that life doesn’t — you don’t get forever,” McDermott said. Despite his first serious intraparty challenge from Seattle Democratic state Rep. Brady Walkinshaw, McDermott said he had little doubt he could have won a 15th term this year. “But the question was, ‘Do you want to go back there and do it for another two years?’ And the answer was no,” he said. First elected to Congress in 1988, McDermott, a former state legislator and Navy psychiatrist, honed a reputation as a health-care policy wonk, a world traveler and an outspoken liberal whose views mirrored the politics of his Seattle constituents. He received national attention and the nickname “Baghdad Jim” for a 2002 trip to Iraq in which he denounced the Bush administration’s push for war. On Monday, McDermott said that war has remained an unending disaster. “Somebody had to say that stuff, and this district gave me the power to do it,” he said. McDermott also achieved notoriety for leaking to newspapers audio of a 1996 phone call between then-House Speaker Newt Gingrich and other Republican leaders, including former Rep. John Boehner, plotting ways to publicly deal with an ethics investigation of Gingrich. Boehner sued McDermott over the leak, and the Seattle Democrat wound up paying him more than $1 million in damages under a court order. McDermott’s retirement announcement disrupted the Seattle-area political scene, with several potential candidates quickly confirming interest in running for the seat. One possible contender who’d have serendipitous name identification is King County Councilmember Joe McDermott, whose full name is James Joseph McDermott. Joe McDermott, who is not related to the congressman, confirmed he’s “carefully weighing” entry into the race and will have a decision within a week. In addition to Walkinshaw, who announced a challenge to McDermott last month, several state legislators have been mentioned as possible candidates. State Rep. Reuven Carlyle, D-Seattle, and state Sen. David Frockt, D-Seattle, both said they’re also considering a run. Seattle City Councilmember Kshama Sawant, a socialist, would not rule out a candidacy. She does not currently live within the 7th District, but congressional candidates are not required to live in the district they’re seeking. A spokesman for Seattle Mayor Ed Murray said he will not run. Other names floated as potential candidates include former Seattle Mayor Mike McGinn and former U.S. Attorney Jenny Durkan. The once-in-a-lifetime political opportunity could prove irresistible to other ambitious local politicians as well. “There aren’t very many congressional seats in the country where a liberal, progressive person would have a chance to have free rein to pursue anything that he or she would want to — essentially for life tenure, on good behavior,” said state Sen. Jamie Pedersen, D-Seattle, who is ruling himself out of the race. McDermott said he’d been thinking for a long time about leaving Congress and that he announced his decision to family during a dinner on his birthday Dec. 28. He later informed congressional leaders and members of the Washington delegation, and called some state legislators — including some considering a run for his seat. In his remaining year in office, McDermott said his top goal is to pass a major reform package for the nation’s mental-health system — something he’s been working on with Republican U.S. Rep. Tim Murphy of Pennsylvania. While not ruling out a future endorsement, he did not name a preferred successor, saying the district will have plenty of good choices. Asked whether his plans might include returning to Washington, D.C., as a lobbyist like some former members of Congress, McDermott grimaced and said he has no interest in “making a pile of dough” that way. He told reporters if they wanted to understand him and his future, they ought to visit the coffee shop downstairs. In the shop hung a display of McDermott’s paintings, done in the Sumi-e Japanese brush-and-ink technique. His work included meditative scenes of bamboo alongside Zen captions.